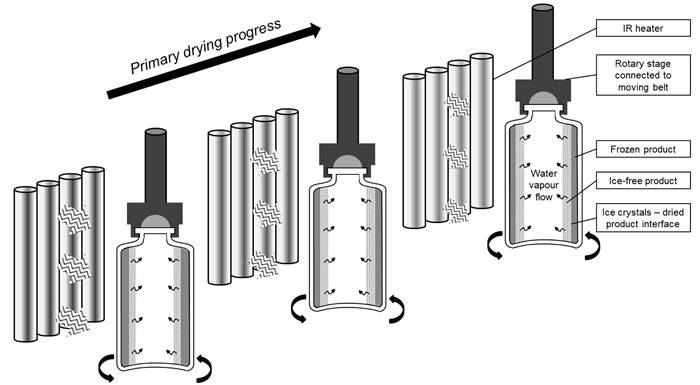 A secondary drying step where most of the unfrozen water (ie, water dissolved in the amorphous phase) is removed by diffusion and desorption. The most important critical quality attributes evaluated after freeze-drying on randomly selected samples using off-line analytical techniques are: (i) the API state (eg, protein conformation) and stability; (ii) the residual moisture content; (iii) the freeze-dried product cake appearance; (iv) the reconstitution time. Upscaling requires complete re-optimisation and re-validation of the process. 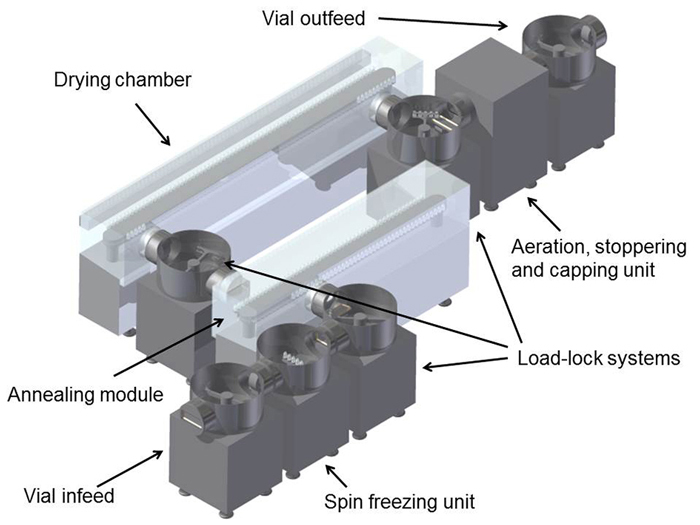 The continuous freeze-drying technology starts with a continuous freezing step where the vials, filled with liquid product, are rapidly rotated along their longitudinal axis (ie, spin-freezing, see Figure 1). The cooling and freezing is achieved by using a flow of sterile gas with a controllable temperature around the rotating vial. Consequently, the resulting frozen product will be spread with a uniform thickness over the entire vial surface (ie, large surface area and thin product layer). The annealing process can be performed by transferring the vials to a chamber with a controlled temperature. 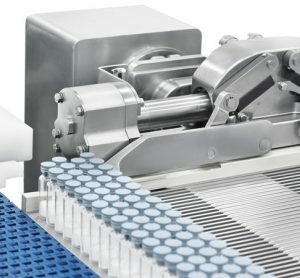 An appropriate load-lock system is used to rapidly transfer the frozen vials between the continuous freezing and the continuous drying unit, without disturbing the specific conditions of pressure and temperature. In the drying chamber, an endless belt system allows the transport of the vials in front of individually controlled radiators which provide the heat transfer to the vials needed for sublimation and desorption, hence allowing individual vial temperature-regulation (Figure 2). In a conventional freeze-dryer, the sublimated ice and desorbed water is collected using cryogenic ice condensers. For this continuous freeze-drying concept, a condenser system is used allowing it to continuously remove the condensed water. Figure 3 illustrates how an industrial-scale continuous freeze-dryer might look. 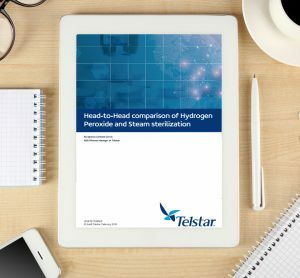 An extra advantage of this continuous freeze-drying set up is the possibility of implementing process analysers allowing measurement and control at the level of the individual vial. This integrated approach leads to strongly reduced variability of critical quality attributes. 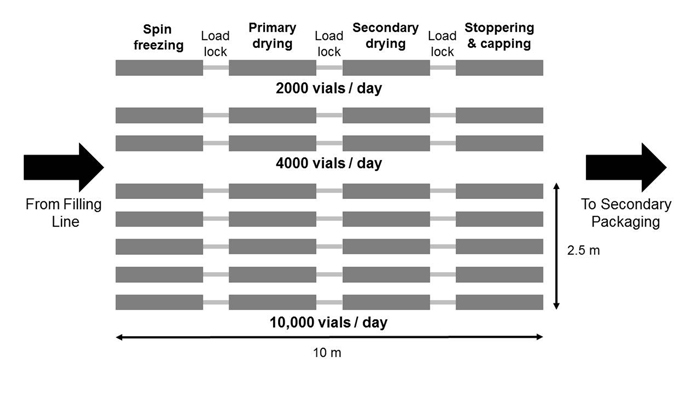 Figure 4 shows schematically that increasing the vial throughput (ie, scale-up) can be simply done by adding parallel lines in the continuous freeze-drying technology modules (ie, Lego principle). 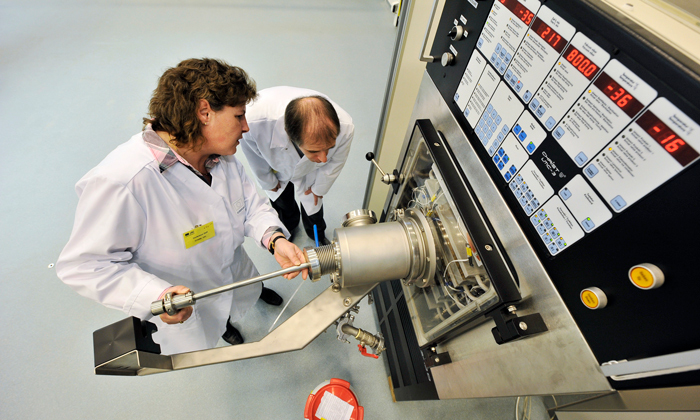 A GMP-like engineering prototype (Figure 6) where all process modules are integrated and freeze-drying is executed in a continuous fashion. This prototype is engineered around the implementation of needs to create and keep a sterile environment by choosing the proper materials and design principles. Further, the implementation of the relevant PAT tools such as NIR is incorporated and the implementation of the results from mechanistic modelling leads to optimal process conditions. Gieseler H. Insights in lyophilization 2012. Current best practices & research trends. 2012. Antwerp. Pikal MJ. Freeze Drying. Encyclopedia of pharmaceutical technology. 2002;1299-1326. Kasper J, Friess W. The freezing step in lyophilization: physico-chemical fundamentals, freezing methods and consequences on process performance and quality attributes of biopharmaceuticals. European Journal of Pharmaceutics & Biopharmaceutics. 2017;78:248-263. Van Bockstal PJ, Mortier STFC, Corver J, Vervaet C, Nopens I, Gernaey KV, De Beer T. Quantitative risk assessment via uncertainty analysis in combination with error propagation for the determination of the dynamic Design Space of the primary drying step during freeze-drying. European Journal of Pharmaceutics & Biopharmaceutics. 2017;121:32-41.
International Conference on Harmonization (ICH) of technical requirements for registration of pharmaceuticals for human use, Topic Q8(R2): Pharmaceutical Development. 2009. Geneva. United States Food and Drug Administration (FDA), Guidance for industry PAT – A framework for innovative pharmaceutical manufacturing and quality assurance. 2004. United States Food and Drug Administration (FDA), Pharmaceutical CGMPs for the 21st century – a risk based approach. 2004. Van Bockstal PJ, De Meyer L, Corver J, Vervaet C, De Beer T. Noncontact infrared-mediated heat transfer during continuous freeze-drying of unit doses. Journal of Pharmaceutical Sciences. 2017;106(1):71-82. Van Bockstal PJ, Mortier STFC, De Meyer L, Corver J, Vervaet C, Nopens I, De Beer T. Mechanistic modelling of infrared mediated energy transfer during the primary drying step of a continuous freeze-drying process. European Journal of Pharmaceutics & Biopharmaceutics. 2017;114:11-21. 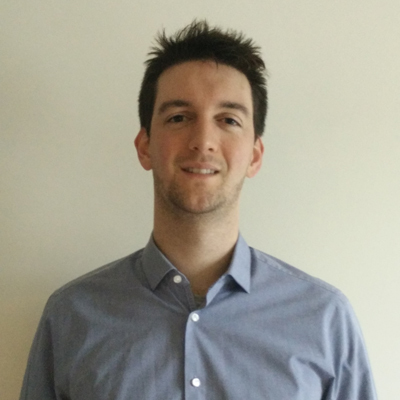 PIETER-JAN VAN BOCKSTAL obtained his MS in drug development (2013) from Ghent University, Belgium. Currently, he is pursuing his PhD at the same university under the supervision of Prof Thomas De Beer. His research project aims at developing a continuous and controlled freezedrying technology for unit doses based on noncontact energy transfer via infrared radiation. JOS CORVER holds a degree in applied physics in the field of rheology and physical transport phenomena. After a rich career in various industries, he started his own company in 2011, RheaVita, which strives for innovative improvements in pharmaceutical processing, specifically in the field of continuous freeze-drying.